All vehicles are reviewed by us before they are consigned to the sale. Vehicles will be accepted and assigned a number in the sale based on their market potential, condition, and pricing. Highly desirable cars in excellent condition with verified history will receive the most favorable positioning and promotion. and then FAX to: 417-336-5616. Send high-resolution photos to photos@bransonauction.com. Only vehicles that are consigned as “No Reserve” prior to being offered for sale receive 6% rate. Check-in is at the South end of the Convention Center. 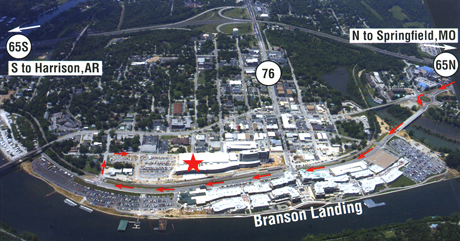 Exit Hwy 65 at ‘Branson Landing Blvd’ – going EAST, left lane around and through the round-about. -Return to the check-in area where staff will verify VIN and odometer reading. Please verify that VIN on vehicle matches VIN on the title. If numbers do not match or if VIN cannot be located on the vehicle for verification, the vehicle will not be allowed in the sale.